On a recent Sunday morning, I got up at 6:30 a.m. and headed down to Santa Ana, CA to participate in the 4th Annual Ladies of Intrigue event. I’m not usually up that early, especially on a Sunday, but this was a special occasion. 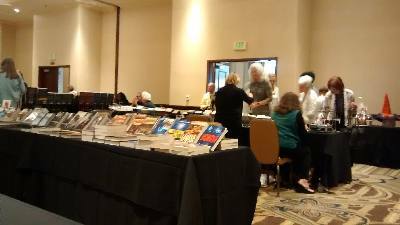 Co-sponsored by the Mystery Ink bookstore in Huntington Beach, CA and Orange County’s Sisters in Crime chapter, it was similar to the Murder on the Menu event I mentioned in a post several months ago. 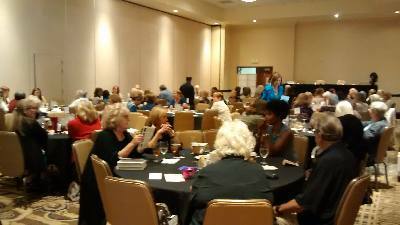 The main difference: author participants were all women mystery authors. We spanned the crime fiction realm from cozy to suspense to historical to...whatever you can think of. One of the headliners was best-selling author and criminal attorney Marcia Clark who was interviewed by Barbara DeMarco-Barrett, author and KUCI-FM show host. The other was suspense writer and New York Times best-selling author Wendy Corsi Staub aka Wendy Markham, author of more than seventy! novels. The interview with Marcia was interesting and Wendy’s talk was inspiring. I was one of the panelists which also included Jill Amadio, Greta Boris, Carola Dunn, Naomi Hirahara, Elizabeth Little, Nadine Nettmann, Kaira Rouda, Alexandra Sokoloff, Jeri Westerson, Patricia Wynn and Pamela Samuels Young. The event lasted from 8 a.m. to 3 p.m. That seems like a long time, but it sure went by fast. I’m always interested in hearing other authors speak about writing and their books so I had a good time listening to the other panelists talk about their experiences. The women at my table were great fun to talk with and I enjoyed myself immensely, though I admit to being a bit tired at the end of the day, but it was well worth getting up so early. Labels: "Ladies of Intrigue", "Marcia Clark", "Mystery Ink", "Sisters in Crime", "Wendy Corsi Staub"
It was. I knew a number of the authors, but there were others who I'd only vaguely heard of. Interesting group. By the way, am I wrong, or do you not do a heck of a lot of travelling!? It was definitely worth getting up early Marianne. I really enjoyed meeting the fans too. This year I've done a lot more traveling than usual. Most of the trips were to conventions. I usually go to Las Vegas at the end of February for a painting convention (45 minute plane ride away). This year I also went to Left Coast Crime in Hawaii because, well, it's Hawaii and it was around my birthday. Then I went to Malice Domestic in Maryland in May. Then it was my mom's 95th birthday so we drove up to Seattle end of June/early July. Hmmm...that is a lot, isn't it? At least I'm home until Thanksgiving or Christmas when I'll be heading up to Seattle. Wow! Yes, that is a lot of traveling! I consider a 40 mile drive to the west coast a huge inconvenience - ha ha! From what you say, you also paint, yes? How lovely and how busy you must be! My sister is also an artist in the US (she lives in North Carolina). Like you, she clocks up an awful lot of miles to exhibit and to keep in touch with her art friends and colleagues. I'm not sure I would cope with all that traveling, but maybe if I had, to I would! My hobby is decorative or tole painting. I don't exhibit or anything like that. My sister and I go to Las Vegas every year for a painting convention. Great fun! We drive a lot here in Southern California. Or at least most people do. I generally only put 4,000 miles on my car in a year. But I will go to events that take me one to two hours to get there. That doesn't mean they're terribly far, just lots of traffic at times. Next year looks to be another travel year for conventions, at least in the early part of the year. Las Vegas, LCC in Reno, then Malice in Bethesda. Thanks, Sybil. I had look up "tole painting". Lovely! What is a novel’s most essential ingredient? Will the real writer stand up? Would you use a bookless library?